With Firefox 4 emerging as a public beta this week, it’s time to take a closer look at the next version of Mozilla’s Web browser. I spent some time with this pre-release version to see how it compares to its predecessor. At launch, Firefox 4 looks very much like Firefox 3—which came as something of a surprise to me, after reading about the browser’s new interface featuring tabs on top and an easy way to switch tabs from the URL bar. As it turns out, these interface changes (and most others) are missing from this beta version of Firefox for Mac OS X. They are, according to Mozilla, “coming soon,” but they’re not here yet. So beyond the behind-the-scenes changes, what is different about Firefox 4? The first thing I actually noticed was that the add-ons manager, which used to open its own special window, now appears as a new browser window (or tab, depending on your preferences). Add-ons are shown in a standard browser window in the Firefox 4 beta. 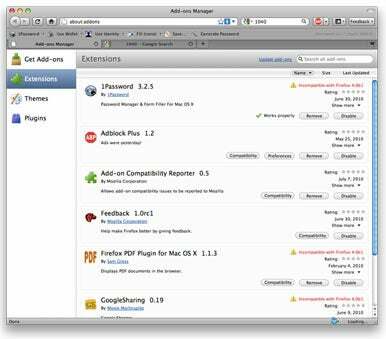 Another add-on related change allows you to install add-ons without restarting the browser. Or at least, that’s the plan. While it may eventually be true, it’s not the case right now when trying to install and use extensions that don’t officially support Firefox 4—I had to restart my browser to activate such extensions. When disabling an extension—even one officially supporting Firefox 4—I had to restart the browser for the change to take effect. Chrome handles this process much better, enabling and disabling extensions on the fly. Features still planned for Firefox 4—but not present in the beta—include sync (for syncing settings, bookmarks, and so forth across devices), new privacy controls, and further speed improvements. Firefox 4 also features improved crash prevention, at least relative to Flash, QuickTime, and Silverlight plug-ins. If one of those plug-ins crashes, it won’t lock up the rest of Firefox—just the affected window (or tab) will be unusable. The Firefox 4 beta launches another copy of itself to show some Flash content. If it’s not clear yet, Firefox 4 is definitely a beta application. In addition to the dual-icon oddity, I saw a couple of crashes, and QuickTime video playback stressed the CPU on my MacBook Pro enough to quickly ramp up its fans. The browser feels plenty fast—but then again, I never felt that the previous versions were slow—and most of my key extensions work as is (with the exception of Xmarks). In short, Firefox 4 is usable, but far from complete. But that’s fine—it is, after all, a beta. I have no doubts that the final release of Firefox 4 (due out later this year) will be a fast, feature-rich browser. For now, though, given its unfinished Mac OS X interface, Flash-related double-icons, and general lack of refinement, you may want to stay away from this beta release, unless you really like living on the experimental edge.